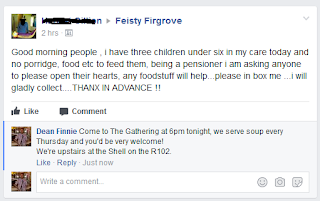 When I saw this Facebook post earlier today I couldn't help but respond knowing that The Gathering serves soup and sandwiches every Thursday in the Firgrove community. 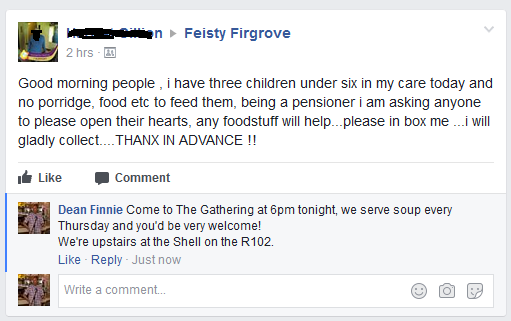 Having invited the poster along I wasn't really expecting her to turn up, but it was a pleasure to meet her at tonight's Soup Kitchen and to be able to serve her and her grandchildren. I love that we radically impacted her and her expectaions of the community just by doing what we always do. We filled an icecream tub with soup and gave her a whole loaf of bread made into sandwiches and she was thrilled. Thank you Lord! Hopefully we'll see her again and we can continue to minister to her and her family.